The Monster Energy NASCAR Cup Series tour offers fans the thrills of nose-to-tail drafting packs at Daytona and Talladega, the beating and banging at short tracks like Bristol and Martinsville and the high speeds of the mile-and-a-half tracks like Charlotte and Atlanta. Clint Bowyer believes you have to add Auto Club Speedway in Fontana, California to that list for one simple reason: restarts. For proof of the Stewart-Haas Racing (SHR) driver’s claim, one only needs to tune in to FOX at 3:30 p.m. EDT Sunday to watch the fifth race of the 2018 Cup Series season – the Auto Club 400. Bowyer says the wild restarts at the track east of Los Angeles are as spectacular from behind the steering wheel as they are in the grandstands and on television. Bowyer knows what he’s talking about when he cites the frenetic racing at Fontana. Last year, he started the overtime in seventh place and raced to third in the two laps of competition before the checkered flag waved. It capped a day that saw Bowyer earn points in all three stages of the race, and it marked his third top-three finish at Fontana. Bowyer will carry Rush Truck Center decals on his No. 14 Ford Sunday when he makes his 438th career Monster Energy NASCAR Cup Series start and 18th career Cup Series start at Fontana. He owns three top-five finishes and eight top-10s and has led 47 laps. Bowyer said he loves the challenge the track presents to the drivers and teams. The width of the track also poses some challenges for both the driver and his spotter. 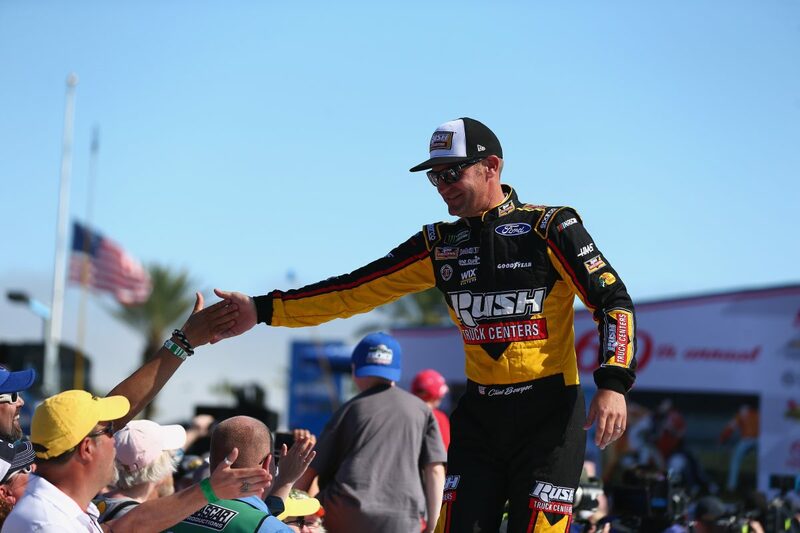 Bowyer arrives at the end of the Cup Series’ three-race West Coast swing after finishing sixth at ISM Raceway near Phoenix last weekend. That finish, coupled with a 15th at Daytona, third at Atlanta and 18th at Las Vegas, vaulted Bowyer to ninth place in the standings. Most importantly, the SHR organization is on a roll. All four SHR drivers finished in the top-10 Sunday at Phoenix, and Kevin Harvick won his third consecutive race and the 46th overall win for SHR. It was the organization’s 42nd points-paying Cup Series win and SHR’s sixth Cup Series victory with Ford. Harvick leads the points with Bowyer, Aric Almirola and Kurt Busch ninth, 10th and 11th in points. Bowyer would like to see the success continue this weekend at Fontana, where SHR owns two victories scored by Tony Stewart in October 2010 and March 2012. What is it like to drive at Auto Club Speedway? What is the secret to success at Auto Club Speedway?